"Emma's dog, Toby, was always in trouble. On Monday he got into the garbage. On Tuesday he ran into the road. On Wednesday he ate a loaf of bread that Emma's dad had just baked." No matter what day of the week it is, Toby's up to no good. His owner, Emma, doesn't know what to do! 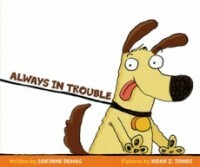 So she takes him to dog training school, where Ms. Katz teaches him everything a dog needs to know. By week's end, Toby has learned some surprising new tricks, leaving no doubt as to why he is top dog in Emma's eyes! And yet Toby's bad behavior continues. So Emma takes him to dog training classes. . .where Toby is a star pupil. He graduates with honors. But he goes right back to his acting out. Emma is at her wit's end, so she takes Toby back to dog training school, where the teacher offers to keep him for a week for "special training." When he comes home, Toby is amazing. He no longer gets into the garbage; instead he takes the garbage out. He bakes bread and vacuums. On and on, this canine paragon goes performing chores and being perfect. But, as we find out on the final spread "no dog can be perfect always" and Toby vanishes through a die-cut hole in the page. Kids will relate to and get a kick out of a hero who doesn't always do the right thing . . .and even when he does, slips up in the most hilarious way. Cartoony illustrations add to a clever story that's enjoyable for adults and kids alike.